FortiPresence - Analytics License 3 Year Multi-Year License for FortiPresence PRO Analytics service. 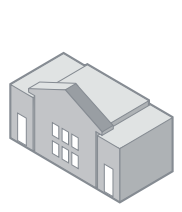 Provides access for 1 Wireless Access Point. FortiPresence - Analytics License 5 Year Multi-Year License for FortiPresence PRO Analytics service. Provides access for 1 Wireless Access Point. The advent of smartphones and the expansion of online retailers like Amazon are challenging the market for offline brick-and-mortar retailers. A further threat to offline retailers is showrooming, the practice of customers viewing and trying a product in-store, then buying it online. Until now, online retailers had an unfair advantage as their platforms have been collecting consumer data for years. This data enables them to monitor shopping behavior, customer loyalty, and promotion impact. Real-time location trends, total visitors, time spent in store, comparison across stores, and heat maps with animated flows. Social WiFi, conversion and bounce rates, visitor contact info, and wayfinding and related services. 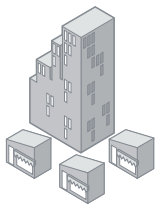 No hardware to purchase or manage means quick and easy deployment. Which store has the most traffic, largest customer base, or most customer loyalty? Does the new window display bring in new customers? How long do customers stay and how many are repeat customers? What campaigns are making customers stay longer? What is the ROI on the marketing dollars that are being spent? How long do people spend in the mall? What are the movement patterns of people in the mall? Is the difference in rent due to foot traffic of the location justified? How many people are visiting more than one store? Which aisle cap or department gets more foot traffic? How many customers are at register queue? Are my employees opening the store on time? Should I open earlier or close later? The solution leverages the existing in-store Fortinet access points or FortiWiFi wireless LAN infrastructure to detect each customer's smartphone WiFi signal. 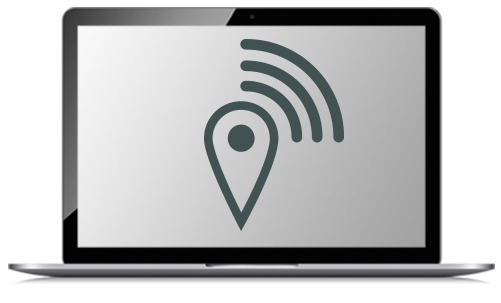 Smartphones continually scan for wireless access points, and FortiPresence uses this signal to detect customer presence, location and movements. This information is processed in the cloud and presented in a simple dashboard format, providing the retailer with actionable insights into their customers. Example dashboard highlighting new versus repeat customers, their dwell duration and a real-time customer dwell heat-map. Smartphone emits a WiFi probe signal, even if it is in the customer's pocket and not connected to the WiFi network. FortiAP or FortiWiFi captures the MAC address and signal strength information from the Smartphone. On-site APs or FortiWLC summarizes and forwards the data records. Fortinet's FortiPresence service receives data via a secure SSL connection. 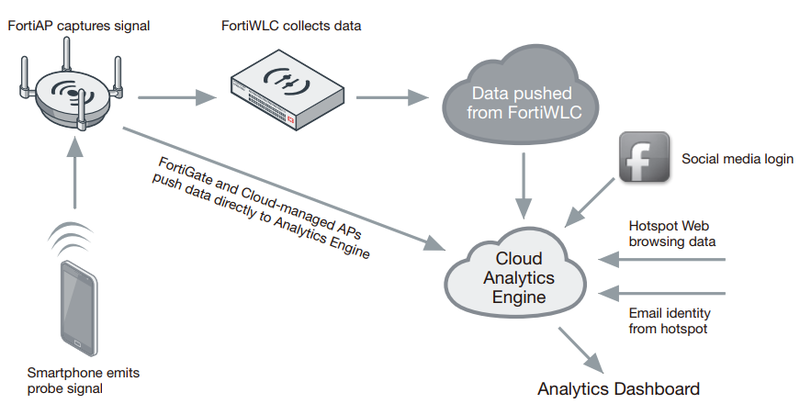 FortiPresence analytics engine processes and correlates the data. Data is displayed in the analytics dashboard in an actionable format. 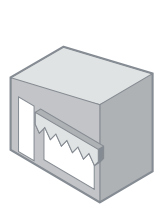 Download the Fortinet FortiPresence Datasheet (PDF). FortiPresence - Analytics License 3 Year Multi-Year License for FortiPresence Analytics service. Provides access for 1 Wireless Access Point. FortiPresence - Analytics License 5 Year Multi-Year License for FortiPresence Analytics service. Provides access for 1 Wireless Access Point. FortiPresence - Campaign License 3 Year Multi-Year License for FortiPresence PRO Campaign service. Provides access for 1 Wireless Access Point. FortiPresence - Campaign License 5 Year Multi-Year License for FortiPresence PRO Campaign service. Provides access for 1 Wireless Access Point. Multi-Year License bundle for all FortiPresence PRO services. Provides access for 1 Wireless Access Point. FortiPresence - Social Wi-Fi License 3 Year Multi-Year License for FortiPresence PRO Social Wi-Fi service. Provides access for 1 Wireless Access Point. FortiPresence - Social Wi-Fi License 5 Year Multi-Year License for FortiPresence PRO Social Wi-Fi service. Provides access for 1 Wireless Access Point.